An open-source C++ library extending the C++ library GiNaC which provides algebraic capabilities including support for symbolic manipulations on polynomials. GiNaCRA aims at providing real algebraic computations based on the efficient GiNaC framework. 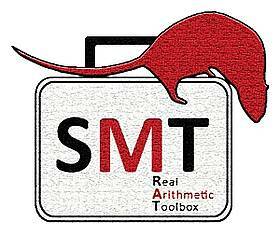 An open-source C++ toolbox offering theory solver modules for the development of SMT solvers for nonlinear real arithmetic (NRA). Please give name and surname so we can identify the person uniquely.